Help to Build the Great Altar. 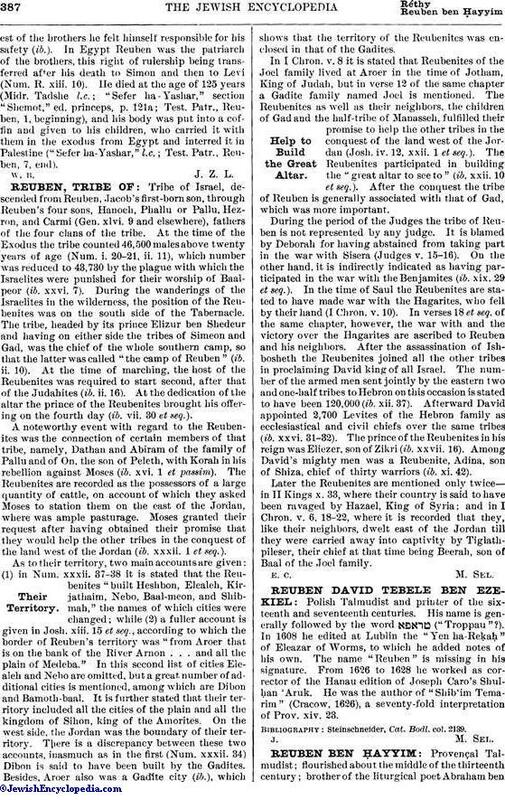 Tribe of Israel, descended from Reuben, Jacob's first-born son, through Reuben's four sons, Hanoch, Phallu or Pallu, Hezron, and Carmi (Gen. xlvi. 9 and elsewhere), fathers of the four clans of the tribe. At the time of the Exodus the tribe counted 46,500 males above twenty years of age (Num. i. 20-21, ii. 11), which number was reduced to 43,730 by the plague with which the Israelites were punished for their worship of Baalpeor (ib. xxvi. 7). During the wanderings of the Israelites in the wilderness, the position of the Reubenites was on the south side of the Tabernacle. The tribe, headed by its prince Elizur ben Shedeur and having on either side the tribes of Simeon and Gad, was the chief of the whole southern camp, so that the latter was called "the camp of Reuben" (ib. ii. 10). At the time of marching, the host of the Reubenites was required to start second, after that of the Judahites (ib. ii. 16). At the dedication of the altar the prince of the Reubenites brought his offering on the fourth day (ib. vii. 30 et seq.). A noteworthy event with regard to the Reubenites was the connection of certain members of that tribe, namely, Dathan and Abiram of the family of Pallu and of On the son of Peleth, with Korah in his rebellion against Moses (ib. xvi. 1 et passim). The Reubenites are recorded as the possessors of a large quantity of cattle, on account of which they asked Moses to station them on the east of the Jordan, where was ample pasturage. Moses granted their request after having obtained their promise that they would help the other tribes in the conquest of the land west of the Jordan (ib. xxxii. 1 et seq.). As to their territory, two main accounts are given: (1) in Num. xxxii. 37-38 it is stated that the Reubenites "built Heshbon, Elealeh, Kirjathaim, Nebo, Baal-meon, and Shibmah," the names of which cities were changed; while (2) a fuller account is given in Josh. xiii. 15 et seq., according to which the border of Reuben's territory was "from Aroer that is on the bank of the River Arnon . . . and all the plain of Medeba." In this second list of cities Elealeh and Nebo are omitted, but a great number of additional cities is mentioned, among which are Dibon and Bamoth-baal. It is further stated that their territory included all the cities of the plain and all the kingdom of Sihon, king of the Amorites. On the west side, the Jordan was the boundary of their territory. There is a discrepancy between these two accounts, inasmuch as in the first (Num. xxxii. 34) Dibon is said to have been built by the Gadites. Besides, Aroer also was a Gadite city (ib. ), which shows that the territory of the Reubenites was enclosed in that of the Gadites. In I Chron. v. 8 it is stated that Reubenites of the Joel family lived at Aroer in the time of Jotham, King of Judah, but in verse 12 of the same chapter a Gadite family named Joel is mentioned. The Reubenites as well as their neighbors, the children of Gad and the half-tribe of Manasseh, fulfilled their promise to help the other tribes in the conquest of the land west of the Jordan (Josh. iv. 12, xxii. 1 et seq.). The Reubenites participated in building the "great altar to see to" (ib. xxii. 10 et seq.). After the conquest the tribe of Reuben is generally associated with that of Gad, which was more important. During the period of the Judges the tribe of Reuben is not represented by any judge. It is blamed by Deborah for having abstained from taking part in the war with Sisera (Judges v. 15-16). On the other hand, it is indirectly indicated as having participated in the war with the Benjamites (ib. xix. 29 et seq.). In the time of Saul the Reubenites are stated to have made war with the Hagarites, who fell by their hand (I Chron. v. 10). In verses 18 et seq. of the same chapter, however, the war with and the victory over the Hagarites are ascribed to Reuben and his neighbors. After the assassination of Ishbosheth the Reubenites joined all the other tribes in proclaiming David king of all Israel. The number of the armed men sent jointly by the eastern two and one-half tribes to Hebron on this occasion is stated to have been 120,000 (ib. xii. 37). Afterward David appointed 2,700 Levites of the Hebron family as ecclesiastical and civil chiefs over the same tribes (ib. xxvi. 31-32). The prince of the Reubenites in his reign was Eliezer, son of Zikri (ib. xxvii. 16). Among David's mighty men was a Reubenite, Adina, son of Shiza, chief of thirty warriors (ib. xi. 42). Later the Reubenites are mentioned only twice—in II Kings x. 33, where their country is said to have been ravaged by Hazael, King of Syria; and in I Chron. v. 6, 18-22, where it is recorded that they, like their neighbors, dwelt east of the Jordan till they were carried away into captivity by Tiglathpileser, their chief at that time being Beerah, son of Baal of the Joel family.